When I set out to launch Viticulture in August 2012, I needed some up-front funds to create some of the art and graphic design for the game. 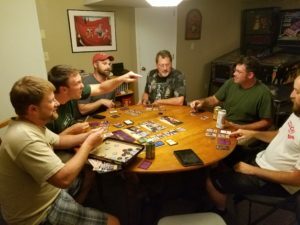 Viticulture has become an extremely successful product for Stonemaier Games, but at the time we didn’t know if it would even fund on Kickstarter. Any funds invested in it may not have amounted to anything. So Alan and I sought a partner to invest a small amount of money in addition to the amounts we each invested. There were other approaches we could have tried, including reaching out to friends/family or even running a mini-campaign just for art like what John Wrot did on The King’s Armory. I was recently talking to Adam Watts of Carpe Omnis Games about his campaign for No Honor Among Thieves, and I learned that he took a different approach to pre-campaign fundraising: He pitched to a number of different investors at an entrepreneurial event. I thought it might be interesting for my fellow creators–particularly first-time creators–to learn from Adam’s experience, and he graciously offered to write a guest post. Thanks Adam! A couple of months ago, I formed an LLC to publish my first card game, and posted about it on Facebook. Not long afterward one of the people who had seen the post got in touch with me and asked if I wanted to participate in an event he was helping set up called Road Pitch. The basic idea was that a bunch of entrepreneurs and investors got on motorcycles and rode around the state visiting different towns and running little shark-tank-like events, one of which would have me pitching my game company and business plan. I honestly wasn’t interested at first. I was getting money from Kickstarter, so why would I need or even want to pitch my company to investors? It seemed like it was the sort of event not meant for indie companies the size of mine, so I was planning on passing on the opportunity until two little things came up that convinced me otherwise. The first was that Greg (the guy in charge of the event in my town) assured me that part of the pitch session was about getting advice and feedback from the Riders, not just investment opportunities. I’d be able to run my plans past actual business people and see if they thought there was a chance I could turn this hobby of mine into something more. In retrospect, this was the most valuable thing I got out of the whole process. The second was that I realized I’d make a pretty major mistake in my budget estimates, and I actually needed about seven thousand more dollars than I’d been expecting to publish the game. This was really not good news for a first-time crowdfunder already worried that I was asking backers for too much. Suddenly, the thought of looking for traditional investment before the Kickstarter didn’t seem like such a bad idea. So I put together a little presentation, practiced it a couple of times, and took the morning off work to go talk to people who weren’t really interested in games about why they might want to consider investing in them. No one turned out to be interested in investing in my company, which didn’t really surprise me. I made a really good presentation (or so people kept telling me, anyway) and I walked away with a lot of good ideas as to how to turn this hobby into a workable business, but I also made a couple basic mistakes that I think could have been easily prevented if I’d thought of them ahead of time. Here’s what I did wrong. If you’re interested in doing something similar, learn from my mistakes. I didn’t explain the market thoroughly. 8 were blown away by how much I knew about the industry and how much planning I’d put into the Kickstarter, and were super enthusiastic about everything. I don’t have any names on the feedback sheets, but I assume these were many of the same people who came up to me afterwards to shake my hand and tell me what a good presentation I’d done. 4 seemed to be confused by the fact that my presentation was about a game company that wasn’t trying to make an online or mobile game like Pokemon Go (one of the questions from the audience even explicitly mentioned that particular app, as did two of the feedback sheets). 4 had genuine criticisms of my business model and presentation that I hadn’t thought about before. These were the most valuable, and by themselves would have made the time and effort I put into the whole thing worth it. 11 didn’t fill out the whole feedback sheet, or didn’t leave any comments to let me know why they gave me the scores that they did. It sounds silly in retrospect, but when I was making my presentation I almost completely forgot that there were people out there for whom “card game” means poker or Uno, not a modern game like No Honor Among Thieves is meant to be. The results of that mistake are obvious: fully 25% of the people who took the time to comment on the forms didn’t fully understand what I was talking about, even after I had discussed the industry for a third of my presentation. This lesson applies most dramatically to niche industries like tabletop game development, but I think everyone can learn from the basic lesson here. Numbers to show your industry is expanding are great, and I had that in spades. Just remember to explain what that industry actually is. I didn’t have a solid plan for expanding. If you’re looking for investors, this is one of the most important things to focus on, and one place where I definitely dropped the ball. I had a bunch of different ideas for directions I could take the business, from publishing house to online content, but I didn’t show that I had a concrete plan established for pursuing any of them, because to be perfectly honest I didn’t. Here’s the thing: investors want to know how you’re going to grow their money, and they want to know how you’re eventually going to get the money out of the business to repay them. One of the questions in the Q&A section of the presentation spoke directly to that concern, with a member of the audience asking what my endgame plan was–selling the company, or selling the rights to the game, or what? How was I getting the money out? Since my business plan boiled down to “turn my hobby into a side business” and my long-term plan was “make more games,” I didn’t have an especially good reply to that question. If you’re going to look for investment, have a better answer than I did. I didn’t show that I actually needed investment money. This is a tricky one for a tabletop gaming company already planning on getting funding from Kickstarter. 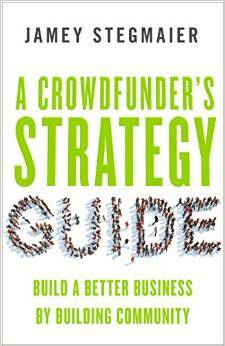 Crowdfunding is often seen as an alternative to traditional venture capital, and rightly so, letting you launch a business with capital from hundreds of backers instead of one or two angel investors. If you’re going to look for traditional investment and crowdfunding, you need to show that you actually need the investors’ money. Compared to the scale of what traditional investment usually brings to the table, I didn’t need all that much for No Honor Among Thieves. On the one hand this made it easier, since I didn’t have to ask investors for millions of dollars, but on the other hand it makes it more difficult because they didn’t want to waste their time with such small fry. I honestly don’t have a good answer for how to play this one. I think the best way to go about it would be to come to investors after having successfully crowdfunded one or two products, to prove to them that your methods work and you’re ready to step into the big leagues, but I don’t have any data to back up that idea. If you’re willing to give it a go, let me know how it works out for you. There were, fortunately, a couple of things that I did do right. Here are some good things to have when you’re pitching to investors. This was what I got the most positive feedback on. My presentation and my answers to the questions asked by the audience made it very, very clear that I’d done the research, and furthermore that I lived and breathed this industry. This was something mentioned on every feedback sheet. I used Stonemaier Games as a case study in my presentation, because the steady increase in funding of their projects from Viticulture to Scythe makes for a really good success story. Going from $66,000 for Viticulture to $1.8 million for Scythe in three years definitely left an impression, with the numbers actually eliciting an audible reaction from the audience. Whatever your business, find someone else who’s proven that it can succeed the way you’re doing it, and succeed dramatically. I hate that this sounds like I’m cronying up to Jamey here, but seriously, what he’s done is impressive. Get something similar for your presentation, and play up the similarities between your company and them. This one seems basic, but it’s still true. You need to be able to speak well. Practice delivering your presentation to the mirror, and to friends, and to anyone who’s willing to sit down and help you out by listening. Don’t just research your market statistics, memorize them. Don’t just read off of the slides, elaborate on them. Don’t um and ah, speak clearly. Practice it. You only get one shot at a first impression. That’s true when you’re putting up your Kickstarter page for the first time, and it’s true when you’re stepping in front of a crowd to speak. That was my experience at Road Pitch. It was fun to present, and I’m glad I did it, but I’m not sure if I want to or need to do it again. Instead I’m going to take that business advice given to me there and apply it. I’m going to have to eat ramen for a little while to put more money into publishing my game, but I’m fine with that now. I know the numbers, and I know I won’t starve, or even come close. I’ve got a buffer, I’ve got all the estimates and plans and quotes, and I’ve confirmed that I know what I’m doing when it comes to the finances and the business. Here’s my presentation. The video unfortunately cuts out the first couple words, but you get the general idea. Adam blogs about gaming, crowdfunding, art and writing on his blog at www.carpeomnis.com. 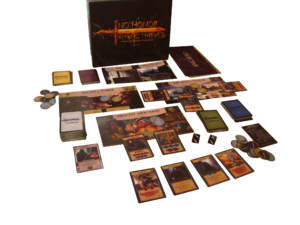 He is currently seeking funding on Kickstarter for No Honor Among Thieves. Check out the campaign here. Nice, I made some similar mistakes when I did a pitch for Massif Games to an entrepreneurial group here in Oregon. As far as I can tell, there aren’t any real credible sources because so few game companies publish their revenue information. Only a handful of the major players are public companies–Games Workshop, Wizards of the Coast, etc. I beefed up the few articles that ICv2 had with some stats from Kickstarter itself (these ones look really impressive: https://www.kickstarter.com/blog/2015-in-games-kittens-zombies-and-kung-fu) and that seemed to do the trick for my presentation. Don’t know how credible a source a quote in a newspaper article would be considered to be by investors, but spotted this in an article I was reading earlier today which seemed relevant to this point. That’s really good data there, actually. If you wanted to take it a step further, I think you could probably go to distributors like Esdevium yourself and ask for their numbers, if you wanted to put together a more thorough report than I did during my presentation. I imagine you’d be able to find some who’d be willing to share the data, if only to brag about how good business is right now. Casual Gaming Revolution has a great stats study on board games on Kickstarter that is worth a look-see. I remember seeing that, actually! That’s the one with all the really good infographics, right? I’m going to chime in here as someone who has made several pitches to entrepreneurial events. Everything he’s said has rung true and I have experienced as well even in my pre Kickstarter phase. I’m lucky enough to be at Purdue University where we have two co-working spaces in town, and a separate group that are Entrepreneurs in residence that advise startups and companies similar to how they would at a incubator, but without the incubation, for free provided your apart of the University, or a woman in Indiana. 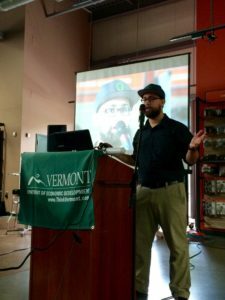 I pitched at events like the Shurz startup competition, the Verge, and another specifically for crowdfunding companies, which we were lucky to have Issac Childres be the Keynote speaker talking about his experience as he is a local businessman. I’ve gotten so much feedback on the company, all of it positive. Things like budget advice and consultation on what if you do it this way or that really helps to refine your idea and give you insights from people who have run businesses before. They also have a weekly meeting with presentations and networking that involve things like how to setup business agreements, forming LLC’s, filing taxes, pitching to investors, and a variety of other subjects. I too used the ICv2 stats for my pitches as at the time Casual Gaming revolution hadn’t come out with their stats study. If you have one of these in your area I encourage people to go check it out, go every once in a while, if nothing else its a sounding board of people who have started businesses before and their feedback can surprise you in a good way. Thanks for sharing this, Sean! I continue to be impressed with how you seek a variety of venues to learn from other creators and entrepreneurs, and it’s great that you have such opportunities at Purdue. We had something similar when I went to Rochester Institute of Technology–it was called the MAGIC Center, which stands for something that I don’t quite remember. According to their posts on my Facebook feed, a team from the incubator there recently launched a video game for the XBox One that they’d been working on, so there’s definitely some game development stuff happening there, even if it’s in another medium. If you live near a university of any kind I would suspect you’ll find something similar on campus. These places are always a good resource for anyone looking to make their hobby into a business. Yeah, lots of colleges have a free center for business development. Our local Pasadena City College even does. Worth looking into. No investment capital to be gained, but lots of free advice from people with experience in the field. A recent visit helped me re-organize my yearly deadline schedule to help me know what to focus on during what weeks. Helps the A.D.D. brain a lot. Thanks for sharing your experience. I was wondering about your short fall. Would you mind sharing what you missed or what unexpected expense resulted in it. As I get ready for my KickStarter launch, the potential of missing something that big is definitely something I’d want to avoid. Thanks in advance. For me, it was something really stupid that I kind of feel ashamed admitting. I missed shipping to backers. For some reason, I hadn’t added that into my budget calculations–I had manufacturing, art and graphic design, freight to warehouses, taxes and fees, every other little thing, but I didn’t have shipping, and if you look at the pie chart on my Kickstarter page you’ll see that ended up being about a fourth of my expected expenses. I ended up raising my planned funding level by $3000 and redoing my personal budget for the rest of the year so that I could put more of my own money into it. So it’s worked out, but damn if that wasn’t a scary day or so after I realized what I’d forgotten. Well, I’ll make sure I don’t miss that one. Thanks for leading the way and sharing. No problem! I love talking about this sort of thing. Thanks for reading.